In a large dutch oven, melt 2 tablespoons butter over medium heat. Add the mushrooms and cook until golden brown and tender, about 10 minutes. Pour the mushrooms into a strainer set over a bowl and set aside. In the same dutch oven, melt the remaining stick of butter on medium-low heat. Add the flour and whisk until smooth (and flour taste is cooked out), about two minutes. Pour in the scalded milk and cook, stirring constantly, until very thick. Season with the salt, garlic powder, and cayenne. (Note: the béchamel sauce is purposefully salty in order to season throughout the entire lasagna dish.) Set aside 1/2 cup of the white sauce. Stir the mushrooms and shredded chicken into the remaining white sauce in the dutch oven. In another bowl, combine the cheeses. 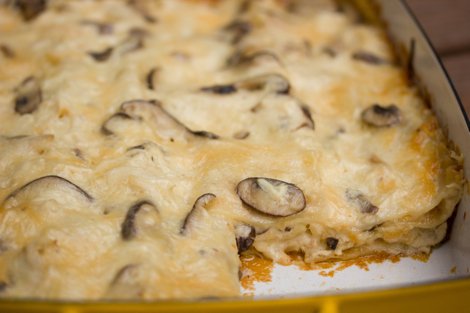 Spread the reserved 1/2 cup of white sauce (without the mushrooms and chicken) into the bottom of the lasagna pan. Arrange 4 noodles into the bottom of the pan, overlapping if necessary. Spread 1/3 of the chicken and mushroom mixture over the noodles, followed by 1/3 of the cheese mixture. Repeat layers, ending with sauce, then cheese on top. Cover the pan with aluminum foil and bake until hot and bubbly, about 1 hour. Remove from the oven, uncover, and allow to cool for 15 minutes before serving.